Sold by cds⚫dvds⚫guaranteed and Fulfilled by Amazon. Comment: *** LIKE NEW CONDITION *** Long Established and Trusted Seller currently has a Limited Quantity Available NOW!! Item is Tested and Professionally Graded ("lightly used, Gift Quality - Like New") having SCRATCHFREE DISC(s) and a clean box with cover art. Also includes our personal guarantee to be an Authentic and Copyright Protected Release that is exactly as pictured and listed, and to be Accurately Graded. International Orders Welcome. Thanks for considering cds dvds guaranteed for your purchase! Sold by cds⚫dvds⚫guaranteed and ships from Amazon Fulfillment. Sold by discountedmediaoutlet and ships from Amazon Fulfillment. Sold by westcoastmedia and ships from Amazon Fulfillment. In this pilot to the Endeavour series, Shaun Evans (The Take) steps into John Thaws shoes as the younger version of Colin Dexters iconic creation, Inspector Morse, shedding new light on the origins of the detective famed for his love of crosswords, classical music, real ale, and classic cars. -- "Foyle's War" ended in 2015 after eight seasons. -- "New Tricks" ended in 2015 after twelve seasons. -- "Inspector Lewis" ended in 2016 after nine seasons. -- "DCI Banks" ended in 2017 after five seasons. -- "George Gently" will end in 2017 after eight seasons. The one bright spot is "Endeavour". This prequel to "Inspector Morse" is still going strong in it's fourth season. A fifth season has been announced for 2018. 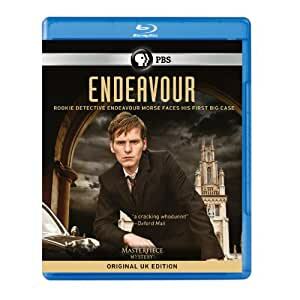 "Endeavour" debuted in 2013, but was set in 1965, when Constable Endeavour Morse joined the Oxford City Police. Promoted to Sergeant Morse in 1969. If it's still on the air ten years from now, we will see the return of "Inspector Morse". If it's still on the air eighteen years from now, we will see the return of Sergeant Robbie Lewis. I always knew Masterpiece Mystery broadcasts on PBS were edited, but was I was surprised to learn exactly how much was cut. An average of ten minutes per episode. Example: Episode One of Season Four ("Game") was 80 minutes, 42 seconds on PBS (not counting the closing credits). The unedited UK version is 91 minutes, 35 seconds on Blu-Ray (not counting the closing credits). Twelve per cent of the show never made it to PBS. This same pattern holds true for the remaining three episodes. The Blu-Ray/DVD contains the uncut British version. Four featurettes totaling 20 minutes, 36 seconds. Oxford University and the Thames River Valley are pretty spectacular. Season 3 ended on a (relative) high note (unlike the messy end of Season 2), with Morse deciding to take the sergeant's exam (though there was a bit of an emotional crisis when Inspector Thursday's daughter decided to leave home). Morse seems to be showing an interest (she's almost as smart as he is). (possibly through the charms of WPC Trewlove - see photo 1). Season Four will be interesting. The Morse franchise begins in 1965 with the early days of Constable Morse, and ends in 2016 with Inspector Lewis departing for New Zealand. A surprising number of characters who we meet in "Endeavour" turn up again in "Inspector Morse", and one even turns up fifty years later in "Inspector Lewis". 1965-2000: Constable Jim Strange is Constable Morse's best friend in the Oxford City Police. 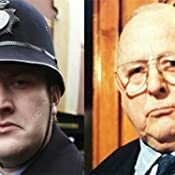 Constable Strange is later promoted to Detective Sergeant ahead of Morse, which puts a bit of a strain on their relationship. He will also be promoted to Inspector, because by 1987 he is CHIEF SUPERINTENDENT JAMES STRANGE, once again promoted ahead of Morse. Still Inspector Morse's best friend on the force. Chief Superintendent for all 33 episodes of Morse. 1965-1988: Home Office Pathologist assigned to the Oxford City Police. Dr. DeBryn appears in all the Endeavour episodes and in the first seven Morse episodes, retiring in 1988. Philip Hathaway, the Mortmaigne family gardener, is one of the suspects. Inspector Lewis is surprised to learn that his Sergeant, James Hathaway, is the son of Philip Hathaway, and was raised with the Mortmaigne children. --- 2016: Philip Hathaway returns for the final three episodes of "Inspector Lewis". He is suffering from Alzheimer's and barely remembers his son James. -- 1965: Constable Endeavour Morse admires a red Jaguar Mark II (license number 248 RPA) in a dealer's showroom. The Jaguar Mark II was produced between 1959 and 1967. 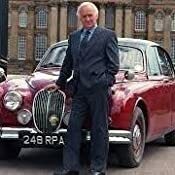 In Season Three of "Endeavour", Constable Morse chauffeurs Inspector Thursday in a black Jaguar Mark I.
see Comments One and Two (dated April 23, 2017). Click on "Sort by oldest". Great show! Quality UK shows like this are why I can no longer tolerate US television. There is just no comparison. Give the pilot in season 1 a try and then you will want to have the entire 4 seasons. The acting and production is first class. I saw the main character (Shaun Evans) from this show in a British comedy and I could not believe it was the same person. Shaun Evans' character in this show is so serious and he is an excellent dramatic actor. 5.0 out of 5 starsMorse Almost Goes Gothic - Lots of Tension All Around! 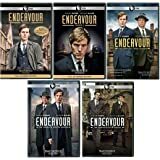 The four episodes of "Endeavour: Season 4" total a bit less than 6 hours. At 1 ½ hours each, there is a lot time for convoluted mysteries and personal stories, but mostly good solid mysteries. Detective Constable Morse has taken his sergeant exam and eagerly awaits the result. And then there's Joan Thursday. If you remember the last episode of Season 3, she and Morse were hostages in a bank robbery. Someone got killed and Joan blames herself. We all have different ways of withdrawing, and Joan picks one rather drastic. Because this series is a prequel to "Inspector Morse", we know that Endeavour Morse will end his life alone. But that doesn't stop us from wishing some happiness on him in this and prior seasons. This results in me and my husband talking to the TV with comments such as "Just SAY it, Morse!" or "No no, don't let her just GO!" In addition to Shaun Evan's intelligent portrayal of Morse, excellent casting has James Bradshaw doing a magnificent job of portraying the young pathologist, Dr. Max DeBryn. You can just see him eventually becoming the wise-cracking unflappable Max in "Inspector Morse". In episode 1, Max says to Morse, "Love and fishing. Sooner or later it all comes down to the same thing. The one that got away." ....1..."Game" A hallmark of an "Endeavour" episode is that at the beginning we are presented with snippets of three or more apparently independent story threads. At the Cowley Baths, the manager tells a customer to start with the Disinfectant Pool before going to the main pool, because "we don't want any verrucas." At a small chapel, a middle-aged woman takes communion. At a news conference, the creators of JASON, a chess-playing computer, prepare for a match with a Soviet chess master. At a bookstore, author Kent Finn is reading from his latest murder mystery. And then we see a man's body floating facedown in the Cherwell River. To which snippet does he belong? Trivia: I had to look it up. A verruca is a plantar wart. ....2..."Canticle" Mrs. Joy Pettybon leads the National Clean Up Television Society, urging the removal of smuttishness from TV shows and music. She's in Oxford for a TV appearance, and Morse is assigned to protect her. When where he really wants to be is investigating a murder of a worker at the country estate of The Wildwood, a smash hit rock group. Trivia: The beautiful estate used in filming is West Wycombe Park in Buckinghamshire. ....3..."Lazaretto" A lazaretto is an institution, such as a hospital, set aside for those with a contagious disease. In this case, it refers to Cowley General Hospital, where the contagious disease appears to be death by murder. Especially if you end up in Bed 10. ....4..."Harvest" It's September 1967, coming up on the Autumnal Equinox. Morse reopens the cold case of Matthew Laxman, who disappeared five years before near the town of Bramford Mere. Bramford appears to take it's equinox celebrations seriously. It wouldn't go as far as a human sacrifice, would it? 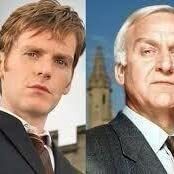 ....A..."Shaun Evans on Endeavour Morse" (5 minutes) On Colin Dexter: "We hit upon the idea of having him represented in one way or another" in each episode. If you're a fan of the original "Inspector Morse", you may remember that Dexter had a cameo in almost every episode. So if you watch this "Endeavour" season closely, you'll see Dexter's phizzog as small bronze bust, an oil painting, and a photo in a newspaper's first page, and in one episode a doctor has his name. ....B..."Shaun Evans Tries Steadicam" (1 minute) Roger Dooley, steadicam operator, gives Evans a try. ....C..."Endeavour and Joan Thursday" (7 minutes) Commentators include Shaun Evans, Helen Ziegler (producer) and Sara Vickers (plays Joan). ....D..."Making 'Endeavour' in Oxford (7 minutes) Commentators include Shaun Evans, James Bradshaw (plays DeBryn), Abigail Thaw (plays Dorothea Frazil), Dakota Blues Richards (plays WPC Trewlove), Jim Loach (director), Ed Rutherford (DOP), Charlotte Mitchell (costume designer), Irene Napier (hair & makeup designer), Helen Ziegler, Roger Allam (plays DI Thursday), Andrew Foster (2nd AD), Alison Butler (production designer) and Sean Rigby (plays DS STrange). Each season they film 3-4 days in Oxford and its a treat. A few parting comments about what I really like about this show. First, there are the high production values. I don't have an expert's eye, but everything seems to feel authentically '60s, down to the old-style tape recorder in Morse's office. Secondly, for a TV show there is some very good cinematography. Thirdly, for me, the incidental music really ratchets up the tension, and often gives the show a gothic feel. 5.0 out of 5 starsIf I could give it 6 stars, I would! I saw this pilot episode a couple of years ago, and remember enjoying it immensely. It was my introduction to the long-running "Inspector Morse" series. The "Endeavour" series is incredibly well done, with Shaun Evans grabbing every scene he is in... unless Roger Allam is there with him, in which case the scene becomes a visual symphony! I re-watched the pilot the other night, and I guess I now own it. I am delighted! I'd forgotten how deeply moving the story and performances were. Morse's keen intellect and observational powers are a consistent thread through this series and the "Inspector Morse" series, but the psycho-emotional origins of some of Morse's idiosyncrasies are brought to light, as devastating events unfold. I think this is a classic, all on its own. 3.0 out of 5 starsWhy the cuts??? The movie which was shown on PBS was excellent! I enjoyed it so much that I bought this DVD. So I am totally shocked that so many parts have been edited out. Why would they do this? The more usual event is that the Masterpiece shows on TV (Such as Agatha Christie movies) have been edited down for television. But in this case, the TV version has the complete movie. The DVD is missing many important parts, not the least of which is the complete ending. Good grief.